Red. Orange. Yellow. Blue. Green. Indigo. Violet. To many people, colors are what you use to paint with and tools we use to describe the outside world. That’s what they were to me before having Jensen. Of course I liked black and grey, but They weren’t bright or anything meaningful. Jensen made every color seem brighter and more vivid. He taught me to see the world in a different light and perspective. It is a gift I will always cherish. After he was born, colors didn’t hold much meaning; really nothing did. Everything seemed bleak and all the vividness he taught me was so muted. Life was different now and that meant I viewed the world around me so differently. Until I moved into my house and walked into his nursery for the first time. My whole house is painted different shades of grey, besides his room. I built up enough courage to go in there and his two colors came back to me. The first colors that flooded my mind when I find out Jensen was a boy. 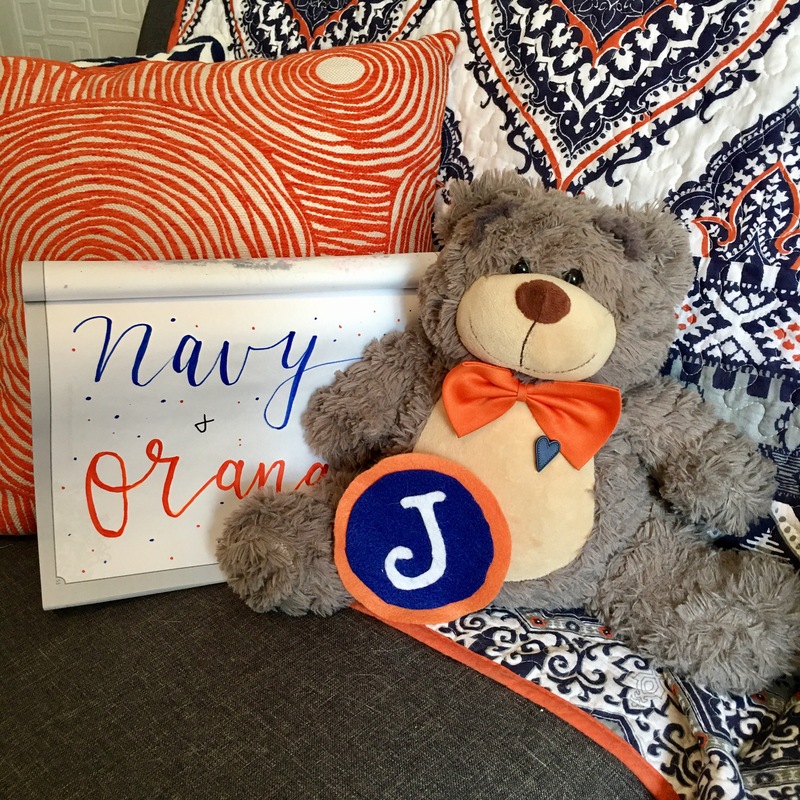 Mixed with grey and white, navy and orange decorate his room. They are the ones many family and friends first saw when they learned about Jensen. My weakness when going shopping. I own more navy and orange than what’s probably normal. The two colors that let me know Jensen is near. They are colors that instantly make me smile, even when I’m crying my eyes out. My newly adopted favorite colors. Jensen’s colors that he uses to paint the sky for me everyday. His colors can turn my day from horrible to great. In my mind, they’ll forever be Jensen’s colors and that’s why I love them so much. I’m thankful to start seeing colors more vividly again. He’s showing me the world as he does now through my healing by leaving me signs of navy and orange. This entry was posted in grieving, Jensen, May We All Heal, stillbirth and tagged child loss, color, grief, loss, May We All Heal, MWAH2017, stillbirth by danielleridgway. Bookmark the permalink.